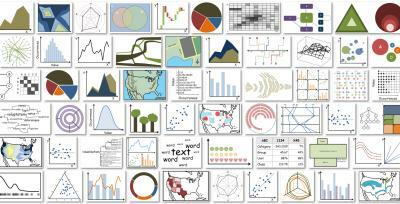 What makes data visualization memorable? It’s easy to spot a “bad” data visualization—one packed with too much text, excessive ornamentation, gaudy colors, and clip art. Design guru Edward Tufte derided such decorations as redundant at best, useless at worst, labeling them “chart junk.” Yet a debate still rages among visualization experts: Can these reviled extra elements serve a purpose? Taking a scientific approach to design, researchers from Harvard University and Massachusetts Institute of Technology are offering a new take on that debate. The same design elements that attract so much criticism, they report, can also make a visualization more memorable. Visualizations that were visually dense proved memorable, as did those that used many colors. Other results were more surprising. Unusual types of charts, like tree diagrams, network diagrams, and grid matrices, were more memorable. The best type of chart to use will always depend on the data, but for designers who are required to work within a certain style—for example, to achieve a recognizable consistency within a magazine—the results may be reassuring. At this stage the researchers hesitates to issue any sweeping design guidelines for an obvious reason: memorability isn’t the only thing that matters. Visualizations must also be accurate, easy to comprehend, aesthetically pleasing, and appropriate to the context. 	Fast loading time. Research indicate users abandon a webpage if it takes too long to load. 	A dedicated search function (for a large website). A useful tool for users to find the correct information. 	The URL’s should be user friendly. 	Legibility. Colours used for text should be reader friendly; for example navy blue on black. 	Menu. Menu should clearly indicate the structure of the website and make it easy to navigate the site. 	Breadcrumbs should be used to let the user know where they are on the website. 	Consistent use of link colours and other graphic enhancements associated with links. The links should preferably be underlined as this is a universal indication of a hypertext link. 	The links should describe the destination page adequately. 	The home page should not be a splash page! It should give an overview of the site at first glance. 	No access restriction (login password, fees). 	Short learning curve to learn how to use the interface. 	Social feedback associated with using the website. 	The user should receive some benefit from using the website; for example find information they required. 	Information should not be more than three clicks away. 	Stability of the information on the site. 	The site should be stable (the site is not down often). 	The website should support different platforms; for example different browsers, operating systems for mobile devices. 	Support physically challenged users. 	Users must be able to resize the content. 	RSS feeds should be provided for the content. 	You should be able to identify the website owner. 	There should be contact information for the website owner. 	Information should be referenced. 	The website should be recognized by related sites. 	It should be explained how private information is used and what information is collected. 	Content should be spell checked. 	No need to scroll to view the homepage. 	No need to scroll to view the beginning of the main content of a page. 	The main content should be easily discernable. 	Sensible, logical structure of information within the website. 	Consistent use of terminology and graphics. 	Pages on the site should have unique titles. 	Terminology used should be familiar to target user. 	The website should provide relevant information. 	Novelty information should be used to keep the user interested. 	Paragraphs should be short and to the point. 	Content on one page should not exceed 3 000 words. The streaming of real-time information across your field of vision is a step closer to reality with the development of a prototype contact lens that could potentially provide the wearer with hands-free information updates. In a study published last year in IOP Publishing’s Journal of Micromechanics and Microengineering, researchers constructed a computerised contact lens and demonstrated its safety by testing it on live eyes. There were no signs of adverse side effects. At the moment, the contact lens device contains only a single pixel but the researchers see this as a “proof-of-concept” for producing lenses with multiple pixels which, in their hundreds, could be used to display short emails and text messages right before your eyes. The device could overlay computer-generated visual information on to the real world and be of use in gaming devices and navigation systems. It could also be linked to biosensors in the user’s body to provide up-to-date information on glucose or lactate levels. The contact lens, created by researchers at the University of Washington and Aalto University, Finland, consisted of an antenna to harvest power sent out by an external source, as well as an integrated circuit to store this energy and transfer it to a transparent sapphire chip containing a single blue LED. One major problem the researchers had to overcome was the fact that the human eye, with its minimum focal distance of several centimetres, cannot resolve objects on a contact lens. Any information projected on to the lens would probably appear blurry. To combat this, the researchers incorporated a set of Fresnel lenses into the device; these are much thinner and flatter than conventional bulky lenses, and were used here to focus the projected image on to the retina. After testing the contact lens in free space, it was fitted to the eye of a rabbit, under the strict guidelines for animal use in the laboratory, to evaluate the effect of wearing the contact lens on the cornea and the body in general. In addition to visualising techniques, a fluorescent dye was added to the eye of the rabbit to test for any abrasion or thermal burning. After demonstrating the operation and safety of the contact, the researchers state that significant improvements are necessary to produce fully functional, remotely powered, high-resolution displays. For instance, the device could be wirelessly powered in free space from approximately one metre away, but this was reduced to about two centimetres when placed on the rabbit’s eye.